How to make a pictograph? (i) First of all, the related data is collected. For example, to form the pictograph showing the number of boys and girls in different classes and in the school as a whole, the number of boys and girls in different classes are counted. (ii) Different symbols are selected for different types of data. As, for the symbol of a boy and a girl, we select a boy’s face and a face with long hair for a girl. (iii) A framework containing columns and rows is made according to necessity as shown on page 193 of this chapter. (iv) The related symbols are made at proper places. The symbol must be clear, simple and recognizable. They should be self-explanatory. (v) One symbol may represent many, i.e., 1, 5, 10, 20, etc., units. The quantity that each symbol represents is clearly indicated in the pictograph. A bus manufacturing company manufactured the following numbers of buses during the first eight months of the year. From a pictograph based on the information given in the above table and answer the following questions. (i) What does the pictograph represent? (ii) In which month did the company manufacture the maximum number of buses? (iii) In which month was the production minimum? (iv) What trend do you notice in the monthly production of buses? 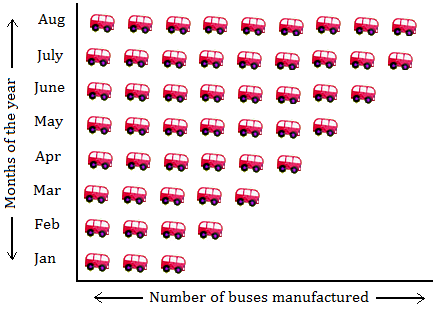 (v) In which months is the increase in production of buses stagnant? Let us represent 200 buses by the symbol of one bus as shown below. We can represent number of buses horizontally and months vertically. (i) The pictograph formed above represents the number of buses manufactured by the company during the first eight months of the year. (ii) The product was maximum in the months of July and August. (iii) The product was minimum in the months of January. (iv) The pictograph clearly shows an increasing production trend except in the month of August when there is no increases in production. (v) The increase in production of buses was stagnant in the month of August.